The ancient civilizations of Mesopotamia and Egypt were both facilitated by rivers that ran in their midst. The Euphrates, Tigris, and the Nile deposited silt along riverbanks which made the adjoining land extremely fertile. This led to the development of cities like Ur and Eriku in Mesopotamia, and Thebes in ancient Egypt. In Egypt, the Nile served as a means of transportation and also provided protection from enemies because its marshy deltas made invasion almost impossible. Ancient Egypt and Mesopotamia, though, had fundamental differences in the way their societies were ruled, as well as in developments concerning cultural and religious life. Ancient Egypt had a different political structure from Mesopotamia. In ancient Egypt, the Pharaoh was considered to be the representative of the gods on earth. The citizens of ancient Egypt believed that their Pharaoh was a god, and refrained from looking directly at his face even when addressed by him (Richards & Van Buren, 2000). The majority of noblemen who were appointed to significant positions in ancient Egypt were related to the Pharaoh. Upon his death, only a son of the Pharaoh could succeed him. In ancient Mesopotamia, society consisted of self-governing regional states for ten centuries before Sargon the Great was proclaimed as king in 2370 BCE (Brisch et al., 2008). The citizens of Mesopotamia, however, did not consider the king or his successors to be divine. In Mesopotamia, most of the scribes were the members of noble families and not related to ruling kings. Another major difference between ancient Egypt and Mesopotamia has to do with religion and culture. In Mesopotamia, women could get permits to participate in trade, and even managed property. However, there were rules enshrined in the Code of Hammurabi which prevented them from inheriting property once their husbands died (Suter & Croddy, 1983). In ancient Egypt, though, women were allowed to take over a third of their husbands’ properties when they became widows. Ancient Egypt and Mesopotamia had highly evolved cultures which supported the development of writing styles and languages. In Mesopotamia, the Sumerians developed the writing system known as cuneiform to facilitate the preservation of records (Richards & Van Buren, 2000). Cuneiform, which was expressed through pie shapes, was written in clay tablets which would then be exposed to the sun to dry. In ancient Egypt, the scribes used hieroglyphics to express ideas and concepts. This language had alphabetic elements as well as logos (Richards & Van Buren, 2000). In ancient Egypt, as in Mesopotamia, multiple gods and goddesses were worshipped. In Mesopotamia, large buildings named ziggurats served as temples where worshippers could make sacrifices and pray (Connan, 1999). In ancient Egypt, temples were ordinary house-like structures where rituals were often conducted by priests to appease numerous gods and goddesses. Ancient Egyptians also took care to prepare themselves for the afterlife during their lives on earth. They believed that the Ka, or human soul, could not survive in the afterlife without its body (National Gallery of Art, 2015). The priests of ancient Egypt were tasked with conducting mummification to preserve corpses. 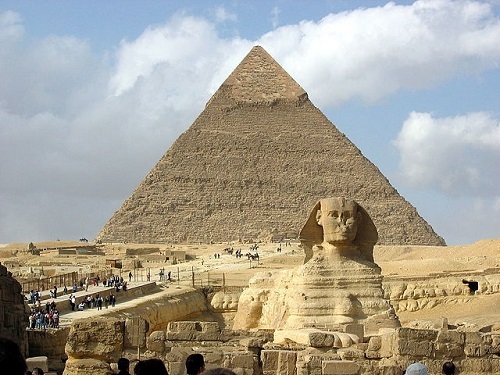 Large tombs known as pyramids were erected for deceased Pharaohs to preserve their bodies and belongings, so that they could use them in the afterlife. As depicted in Gilgamesh, Enkidu and the Netherworld, the people of Mesopotamia were also careful to prepare themselves for life after death (Brisch et al., 2008). Moreover, they buried dead bodies in ceramic jars which were then put in excavations, after first covering them in mats or carpets. The civilizations of ancient Mesopotamia and Egypt thrived due to the long rivers that surged across their lands. Human beings settled along the Nile River in ancient Egypt, and near the Euphrates and Tigris rivers in Mesopotamia to benefit from the silt-enriched fertile land. However, there were significant political, religious, and cultural differences between these two civilizations which pioneered the formation of human communities. Joan Nyokabi. "The Differences Between Ancient Egypt and Mesopotamia." DifferenceBetween.net. February 23, 2016 < http://www.differencebetween.net/miscellaneous/culture-miscellaneous/the-differences-between-ancient-egypt-and-mesopotamia/ >. Thank you this helped out greatly with my world history class! I would start using this website for anything to do with my social studies class. Hi. Just to say thanks so much for an excellent piece if work. Much appreciatedo.